Most people suffer from stress at some point in their lives. Showing signs of stress does not mean that you are a weak person, just human like everybody else. Stress affects different people in different ways — your attitude and personality play a big part in how it affects you, and how you cope with it. Stress is the description used for strain, pressure or force on a system. That system may be you. Stress can be the result of trivial annoyances like driving in heavy traffic, or a life-altering major crisis such as the death of a loved one. Stress can be used both to refer to the event that is causing the disturbance or the effects of that event on your body. Usually when we say we are feeling stressed we are talking about the symptoms caused by our body's stress response. While some short-term stress is thought to be good for you, pushing you to make that extra effort in a sporting event or game, chronic or long-term stress can be harmful to your health. This kind of stress is when you feel under constant, intense pressure, or you just cannot see a way out of a terrible situation. specific steps to deal with particular challenging situations. You may also reflect on any underlying coping styles that make you more vulnerable to stress. Stress commonly results when you feel your resources — for example, time, money or skills — are insufficient to deal with your responsibilities. Doing a ‘stress audit’, where you examine your demands and resources can be a useful first step in dealing with stress. Problem solving techniques may help you cut some problems down to size, or you may need to work on limiting your obligations or asking for extra resources. You may need to accept that there are times in life where you simply can’t do everything that others — or more commonly you — expect. One way to help deal with stress is to maintain a healthier mind and body. Try the following stress-buster tips. Exercise regularly and work off your tensions — but check with your doctor that your chosen physical activity is right for you. Treat yourself to sufficient relaxation time — switch off for a while, as this will help to give you a refreshed and energetic outlook on life. Learn yoga, meditation or other relaxation exercises. Learn to accept what you cannot change but also learn to be more assertive, especially if you are one of those people who always say ‘yes’. Assertiveness training, setting clear boundaries and learning to say no can be very helpful in avoiding overload. Spend time doing things you like, such as seeing people whose company you enjoy, listening to music, playing sport or gardening. Talk about troubles: confide in a special friend or a trained professional. Another person may help you see your problem in a new light. you feel as though there's nowhere to turn. There are qualified professionals who can help — speak to your doctor, who can refer you to the right person. 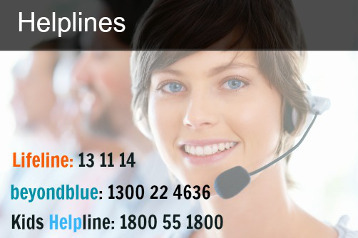 Or there are 24 hour Australian support helplines to get you through a crisis. 1. Australian Psychological Society. Understanding and managing stress (2012). https://www.psychology.org.au/Assets/Files/StressTipSheet.pdf (accessed May 2015). 2. MayoClinic.com. Stress symptoms: effects on your body and behavior (updated19 Jul 2013). http://www.mayoclinic.org/healthy-lifestyle/stress-management/in-depth/stress-symptoms/art-20050987?pg=1 (accessed May 2015). 3. MayoClinic.com. Stress management (updated 8 Apr 2014). http://www.racgp.org.au/afp/2013/august/chronic-stress/ (accessed May 2015).